Tor is an anonymity network that provides software designed to allow you to access the internet anonymously. Unlike VPN, where the VPN provider knows your real IP address, and can see your internet traffic at the exit point (the VPN server), with Tor your signal is routed through a number of nodes, each of which is only aware of the IP addresses ‘in front’ of the node and ‘behind’ it, so that at no point can anyone know the whole path between your computer and the website you are trying to connect with. The name Tor originated in the acronym The Onion Router, which was developed by US Navy and refers to the way in which data encryption is layered, being re-encrypted multiple times as it passes between randomly selected nodes. Tor is therefore considered an extremely secure way to access the internet while keeping your true identity hidden. Tor is endorsed by many civil liberties groups, including the Electronic Frontier Foundation (EFF), and has been widely praised for allowing dissidents, whistleblowers and human rights workers to access the internet, express their views, talk to journalists, and otherwise become involved in political activity that has been banned by their own repressive regimes. It does of course also allow criminals to act with impunity, and famously allows access to the underground market The Silk Road, which only works when connected to using Tor. Those interested in the ethics of internet anonymity should keep a lookout for our upcoming article on the subject. As we noted above, Tor passes data between a number of randomly selected nodes, encrypting it each time. Each node knows where the signal comes from and the node it is going to, but cannot see the whole route (circuit). For reasons of efficiency these relay circuits are randomly reset every 10 minutes so that your actions cannot be linked to earlier actions. Each node is run by a volunteer, and therefore the more volunteers there are, the more secure the whole Tor network is. Volunteering to run an exit node is therefore of great service to the Tor community, and strikes a meaningful blow for freedom and against oppressive censorship. It is also not difficult to set up. However, running an exit node means that other Tor users’ activity, including potentially highly illegal activity, will appear to originate from your IP address, which may lead to trouble. There is an article on how to minimize the risks available here. Installing Tor is very easy these days (it used to be a little more complicated), and it is available for Windows, OSX, Linux/Unix and Android. In Windows you need only download and run Tor package, which will self-extract into a directory of your choice (no additional installation files are added to your computer. Double-click on the ‘Start Browser.exe, and the connection dialogue will start. Once connected, the Tor client starts a customized version of Firefox Portable. Not only is this very lightweight, but it allows you to carry a version of Tor with you on a USB stick (for example) so you can easily access the internet anonymously from any PC. You can now surf the internet anonymously! 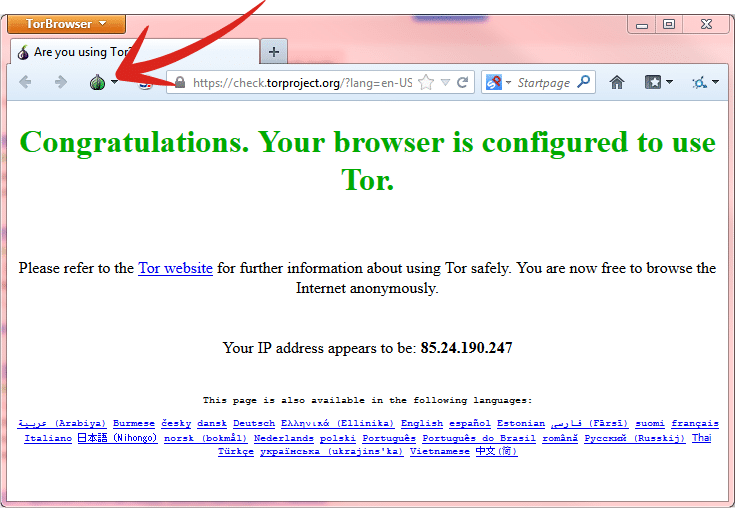 The Tor service can be turned on and off using the Onion icon, or customized using the icon’s drop-down menu. Tor also provides a customized version of the Tails Live CD/USB Linux based distro, so you can boot directly into a secure OS. As you can see, the purpose of Tor is very similar to that VPN’s primary purpose – to maintain internet users’ online anonymity and to evade firewalls. Like VPN, it can also be used to spoof geo-location by the user continually re-connecting until the exit node is in the desired country (quite easy if you want a US based exit node, less easy for smaller or less internet connected countries). However, not only is the technology used quite dissimilar (for a discussion on how VPN works see here), but they are also quite different in use. While it can, at a pinch, be used for location spoofing (see above), Tor is a very fiddly and inefficient way to go about it. In addition to this, the slowness of Tor means that using the service to stream geo-restricted media services is unfeasible. The great advantage of Tor is that you do not need to trust anyone - your internet use is completely anonymized. However it is very slow, and largely as a consequence of this, it is not suitable for many of the most popular activities people want to use VPN for, such as filesharing and streaming geo-restricted media content. If you are looking to stay anonymous whilst torrenting, take a look at our best VPN for torrent sites guide for more information. As long as a trustworthy no logs VPN provider is used, then VPN is a very secure, consumer oriented privacy solution that provides much greater performance and flexibility than Tor can offer. If, on the other hand, you are a mafia whistleblower or a dissident living under a regime in which it would be very dangerous to be caught performing certain activity (such as writing political blogs), then Tor is the safest solution. Just remember that there is no such thing as a 100% guarantee of anonymity, whichever route you take. There are always, at least potentially, loopholes in any security arrangement, and individuals often give their true identities away through patterns of behavior, unguarded comments made while on-line, or any other number of simple and not-so-simple mistakes. It is possible to use Tor and VPN together for increased security and privacy, and we now have an article on this subject available here. Update 19 March 2016: I have now published a full Tor Network Review, which greatly expands on the information contained in this article. Voted up. For a "newblette" you explain things very well for others to be able to follow you to the "Darknet". I am glad that you caution others as to the unsavory elements and to procede with caution. I will be following, great work! Thanks for the very useful and informative site. As to signing in with HMRC and the like, I'm still running Mac OS 10.9.5 - I like its stability and it still does everything I require from a desktop computer. Consequently, I have to run an earlier version of TorBrowser (4.5.1). I don't find it noticably slow but, if I try to sign in to anything like Gmail, online banking, PayPal &c, I'm often blocked and may subsequently receive cautionary emails telling me that someone (me, happily) has tried to access my information from an unrecognised location. I imagine that this would still be the case with more recent versions of Tor. So, while Tor is excellent for general browsing, I revert to Safari for admin stuff. On both browsers I use the DuckDuckGo search engine rather than Google as it does not track users, thus providing a further buffer between me and the ungodly. Hi Lou, Yes. Tor openly publishes the addresses of all its public exit nodes, which makes the very easy to blacklist them. Using a Tor bridge might help overcome this, but as you are not trying to conceal your identity from the HMRC (I presume! ), your approach is sensible. The only think I will note is that running an older version of Tor is not usually recommenced, as it will not be patched against the latest vulnerabilities that have been discovered. Of course, after assessing your own threat model you may decide the convenience/security trade-off worth it, but you should be aware of this point. If tor entrance and exit nodes are run on a volunteer basis, then what would keep "bad" people from volunteering for these services? I mean the entrance node you connect to would have to have the keys to encrypt incoming traffic, and the exit nodes would have keys to decrypt it before sending it out to the Internet right? So if the wrong people volunteered for this, then they could decrypt your traffic and potentially track you. Hi Jeremy, Indeed. Please see the Malicious exit nodes section of Tor Review for a discussion on this. It is precisely why Tor Hidden Services (aka the dark web) was invented - to avoid the need for dangerous Tor exit nodes. Visiting only HTTPS websites mitigates the problem, as does using VPN over Tor (not Tor over VPN). Hi John, I also live in the UK and have a VPN running all the time. I have zero problems signing into my two bank's online web portals or the HMRC Gateway website. I don't know about Tor. Why not give it a try to find out?